Is your little girl ready to hit the open road with a band of gypsies and make a living playing music, fortune telling, and selling various trinkets? We think that sounds like quite the life to lead. However, it is a rather huge change from what her life is on a day-to-day basis. Maybe before you help her pack her things, she could give the gypsy life a test run this Halloween with this amazing Child Gypsy Girl Costume. This stunning outfit comes with three pieces. The first is the off white and berry colored dress, then the teal bolero-style jacket, and lastly the glimmering gold sash. Once all these pieces are brought together your kiddo’s transformation will be nearly complete. All she will need are a few accessories to bring this illusion to life. Grab her a golden moon pendant necklace, as well as a tie-dye bandana, and a set of bangle armlets. If you really want to freak your neighbors out, teach your little one how to use tarot cards and she could do some actual fortune telling! Of course, a crystal ball could have the same effect as well. She just needs to make sure she has enough showmanship to be on the crystal ball level of fortunetelling. 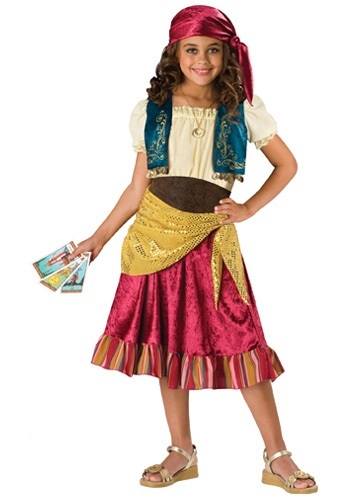 Help your little girl get an idea of the gypsy life this Halloween when you grab her this Child Gypsy Girl Costume. Just don’t be surprised if she loves it and plans to ride off into the sunset with a gang of wild gypsies!